Happy New Year, Jack Frost! Yesterday was one of the coldest mornings I’ve ever seen here. Definitely not the coldest weather I’ve ever seen anywhere, but the coldest this close to the ocean. I started working on transitioning our garden for winter (it seems we have almost completely skipped fall, going from a very long summer straight to winter). I moved my tomatoes and peppers to the greenhouse and planted some cool season annuals in the flower beds. I was feeling quite content until I got an emergency alert last night on my phone with a frost warning. We are in what is normally considered a frost-free zone, so that sent me into a state of panic. I quickly did a Google search to see what types of plants could die from one night of frost exposure. To my horror and dismay, I read that succulents and geraniums are very sensitive to frost. I would estimate that over 50% of our entire property is filled with succulents and geraniums. They are easy to care for, love our usual warm weather, and don’t require much water. They are in my top 5 favorite types of plants, so we have TONS. We literally have spent thousands of dollars on our gardens in the past year, and I would absolutely go nuts if everything died overnight. Our son is normally a night-owl, refusing to go to bed at night, and sleeping in late in the morning. I usually don’t mind since that gives me some alone time in the morning if I want to garden alone, etc. Last night, I guess he was tired out from helping me in the garden all day, so he willingly went to sleep early for the first time ever. It was actually comical…the one night you’re supposed to stay up late, he knocks out early. 🙂 We had planned to go to a New Years Eve party with our neighbors but decided against it since the little guy crashed out so early. Since we didn’t really have anything else we needed to do with the little guy asleep for the night, I talked my husband into helping me cover all of the plants with blankets and sheets. He thought I was a bit nuts until I told him my thermometer outside was reading at 33 degrees. We covered everything with geraniums, succulents and citrus, which was literally almost our entire front yard, back yard, and both patios. I tend to collect blankets like crazy, so that came in handy. We threw shade fabric over one whole section of our front yard. We moved all of my potted tropical plants and ferns to the greenhouse and turned on a heater in there. Thankfully, everything looked in good shape this morning, except for one coleus plant that I didn’t cover. Big apologizes to our neighbors who may have woken up and seen our house looking a bit insane this morning! Hopefully we won’t have to do that again. I just read that last night was the coldest night on record at LAX. 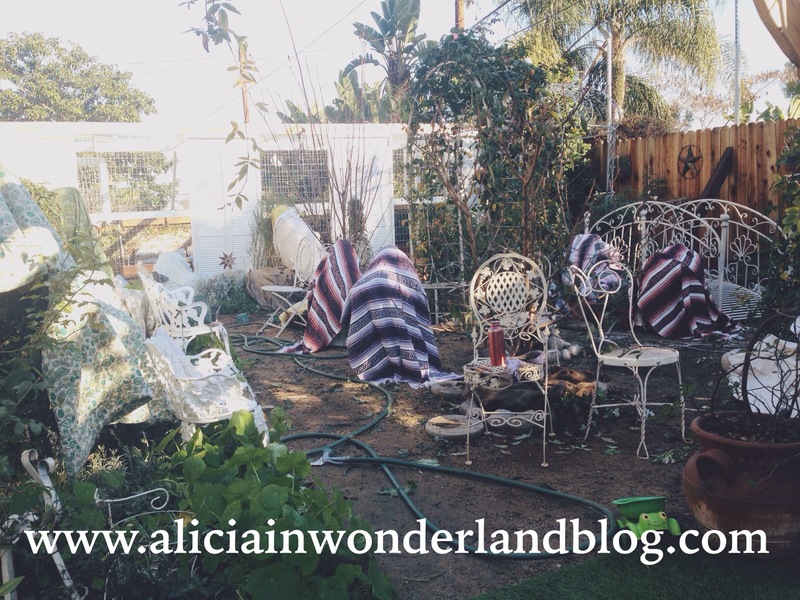 Anyone else ever go plant lady crazy and cover their entire yard in blankets?! This entry was posted in Gardening and tagged california, frost, frost free zone, garden, gardening, los angeles, new years eve, south bay, southern california. Bookmark the permalink.